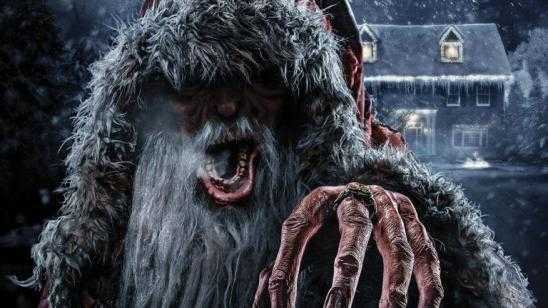 Universal Studios announced the new Krampus Maze attraction for both Universal Studios Hollywood and Univeral Studios Orlando. This announcement is excellent news because the character designs featured in Michael Dougherty‘s Krampus (2015) looked amazing, and I wished I could see them up close. Check out the full poster and trailer video below. 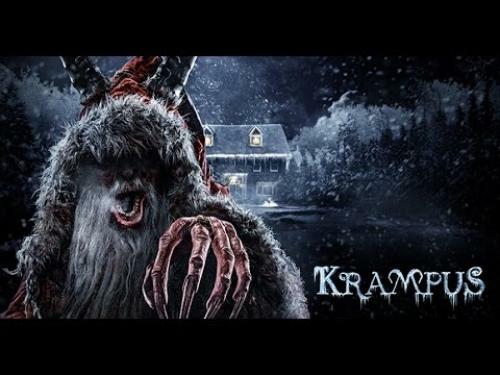 Press Release: UNIVERSAL CITY, Calif., ORLANDO, Fla. (August 4, 2016) - Tis the season for Krampus as Universal Studios Hollywood and Universal Orlando Resort bring the terrifying dark Christmas legend to life in an all-new "Halloween Horror Nights" maze beginning September 16, 2016. The creative minds behind the nation’s best and most extreme Halloween events unleash the wrath of Krampus, Legendary Pictures and Universal Pictures’ Christmas-themed horror film co-written and directed by Michael Dougherty, in a sinister new "Halloween Horror Nights" maze. The dead of winter sets the stage for the terror that’s about to unfold one cold, dank and dreary Christmas Eve as the fabled anthropomorphic "half-goat, half-demon" horned creature emerges to terrorize those devoid of holiday spirit. In scenes lifted from the film, guests will navigate the dysfunctional Engel family home to encounter the evil ancient spirit of Krampus - the dark shadow of Saint Nicholas - and his band of Dark Elves and sinister Gingerbread Men, who cause the family to fight to see the light of day. Universal Studios’ "Halloween Horror Nights" is the ultimate Halloween event. For more than 25 years, guests from around the world have visited "Halloween Horror Nights" in Hollywood and Orlando to become victims inside their own horror film. The streets of each coast’s event are transformed into highly-themed scare zones where menacing "scare-actors" lunge from every darkened corner. Multiple movie-quality haunted houses are erected throughout the event, based on anything from iconic slasher films to hit horror television series to haunting original stories. Additional details about Universal Studios’ "Halloween Horror Nights" will be revealed soon. For more information about Halloween Horror Nights at either Universal Studios Hollywood or Universal Orlando Resort, visitwww.HalloweenHorrorNights.com. Universal Studios Hollywood is The Entertainment Capital of L.A. and includes a full-day, movie-based theme park and Studio Tour. As a leading global entertainment destination, Universal Studios Hollywood delivers highly themed immersive lands that translate to real-life interpretations of iconic movie and television shows. Recent additions include "The Wizarding World of Harry Potter TM" which features a bustling Hogsmeade village and such critically-acclaimed rides as "Harry Potter and the Forbidden Journey" and"Flight of the Hippogriff(TM)," Universal Studios Hollywood’s first outdoor rollercoaster. Other immersive lands include "Despicable Me Minion Mayhem" and "Super Silly Fun Land" as well as "Springfield," hometown of America’s favorite TV family, located adjacent to the award-winning "The Simpsons RideTM." and the all-new "The Walking Dead" permanent daytime attraction. The world-renowned Studio Tour is Universal Studios Hollywood’s signature attraction, inviting guests behind-the-scenes of the world’s biggest and busiest movie and television studio where they can also experience such authentic and immersive thrill rides as "Fast & Furious--Supercharged." The destination also features the Universal CityWalk entertainment, shopping and dining complex, including the Universal CityWalk Cinemas and the "5 Towers" state-of-the-art outdoor concert venue. Updates on "Halloween Horror Nights" at Universal Studios Hollywood are available online at HalloweenHorrorNights.com/Hollywood and on Facebook at: "Halloween Horror Nights - Hollywood," on Instagram at @HorrorNightsand Twitter at @HorrorNights as Creative Director John Murdy reveals a running chronicle of exclusive information. Watch videos on Halloween Horror Nights YouTube and join the conversation using #UniversalHHN. For 25 years, Universal Orlando Resort has been creating epic vacations for the entire family - incredible experiences that place guests in the heart of powerful stories and adventures. Guests can soar above Hogwarts with Harry Potter, swing above the streets with Spider-Man, grab a Krusty burger in Springfield, join the ranks of the Minions and so much more. Universal Orlando Resort has unveiled 18 new guest experiences in the past five years - powerful attractions, incredible dining opportunities and a dramatically themed hotel. And more is on the way. Coming in 2016 is Universal Orlando’s fifth on-site hotel, Loews Sapphire Falls Resort; and Skull Island: Reign of Kong, a groundbreaking attraction in Islands of Adventure. And in 2017 will come Universal’s Volcano Bay, an entirely new water theme park experience.